There are a lot of network attached storage (NAS) solutions available on the market today as it becomes more accessible and user friendly for the masses. It wasn’t that long ago that hooking up a hard drive to your network meant that you’re either incredibly tech saavy or you had to bother someone you knew that was incredibly tech saavy. While I’m sure most of our grandparents would still not be able to put together a solid network-based storage solution, the technology has definitely become mainstream enough for the average user. The N3200 is a solid, black aluminum chassis which houses three SATA drives. Removing the front panel reveals three drive bays complete with a rail system for easy, tool-less installation. Although there are USB and eSATA ports in the rear, they are for expansion. 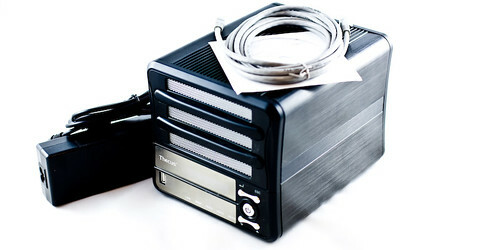 eSATA allows you to easily connect expansion drives while the USB 2.0 allows for the use of cameras, printers and expansion drives. This would make for an interesting security camera setup but I’m sure there are easier ways to do so. There is also a PCI slot which opens up after you remove the back plate but at this time, Thecus doesn’t have anything that goes in it. Apparently it will not be used with this model at all and will only be utilized with newer ones that use the same chasis. The front blue LCD shows information such as the internal temperature, RAID info, ethernet IP addresses and other useful stats. A row of LEDs also displays the state of the hard drives and network. The N3200 supports all sorts of RAID configurations for three hard drives. You can mirror or stripe but I’m guessing most people will go for a RAID 5 setup. If you do happen to choose RAID 1, the setup is a little strange. I couldn’t get all three to mirror at any point so only two drives will be mirrored and one will be entirely separate. I would’ve preferred to have four drive bays rather than three but the N3200 was designed with RAID 5 in mind. With RAID 5, you get the space of two out of three of your drives so that if one fails, you’ll have your data intact and can replace the failed drive easily. Hot-swapping your drives is supported but with a three drive setup, if they’re full then you obviously shouldn’t do more than one at a time.